In recent weeks, we’ve learned some very disturbing truths about glyphosate, the active ingredient in Monsanto’s broad-spectrum herbicide Roundup, which is generously doused on genetically engineered (GE) Roundup Ready crops. GE crops are typically far more contaminated with glyphosate than conventional crops, courtesy of the fact that they’re engineered to withstand extremely high levels of Roundup without perishing along with the weed. A new peer-reviewed report authored by Anthony Samsel, a retired science consultant, and a long time contributor to the Mercola.com Vital Votes Forum, and Dr. Stephanie Seneff, a research scientist at the Massachusetts Institute of Technology (MIT), reveals how glyphosate wrecks human health. Their findings make the need for labelling all the more urgent, and the advice to buy certified organic all the more valid. Mounting evidence now tells us just how false such statements are. I don’t believe that Monsanto is one of the most evil companies on the planet for nothing. The company has done absolutely nothing to improve their worldwide influence on human and environmental health. In the video above, Jeffrey Smith, author of the bestseller Seeds of Deception, says Monsanto, during some reflective moment, must have asked “What would Darth Vader do?” Because what they’ve come up with is a way of pretending that they’re beneficial and then insinuating themselves into the food and agriculture industry, and now it turns out that what they have is very, very dangerous. Interestingly, your gut bacteria are a key component of glyphosate’s mechanism of harm. Monsanto has steadfastly claimed that Roundup is harmless to animals and humans because the mechanism of action it uses (which allows it to kill weeds), called the shikimate pathway, is absent in all animals. However, the shikimate pathway IS present in bacteria, and that’s the key to understanding how it causes such widespread systemic harm in both humans and animals. The bacteria in your body outnumber your cells by 10 to 1. For every cell in your body, you have 10 microbes of various kinds, and all of them have the shikimate pathway, so they will all respond to the presence of glyphosate! Glyphosate causes extreme disruption of the microbe’s function and lifecycle. What’s worse, glyphosate preferentially affects beneficial bacteria, allowing pathogens to overgrow and take over. At that point, your body also has to contend with the toxins produced by the pathogens. Once the chronic inflammation sets in, you’re well on your way toward chronic and potentially debilitating disease. In the interview above, Dr. Seneff reviews a variety of chronic diseases, explaining how glyphosate contributes to each condition. So to learn more, I urge you to listen to it in its entirety. It’s quite eye-opening. The research reveals that glyphosate inhibits cytochrome P450 (CYP) enzymes, a large and diverse group of enzymes that catalyze the oxidation of organic substances. This, the authors state, is “an overlooked component of its toxicity to mammals.” One of the functions of CYP enzymes is to detoxify xenobiotics—chemical compounds found in a living organism that are not normally produced or consumed by the organism in question. By limiting the ability of these enzymes to detoxify foreign chemical compounds, glyphosate enhances the damaging effects of chemicals and environmental toxins you may be exposed to. But that’s not all. Dr. Stephanie Seneff has been conducting research at MIT for over three decades. She also has an undergraduate degree in biology from MIT and a minor in food and nutrition, and I have previously interviewed her about her groundbreaking insights into the critical importance of sulfur in human health. Not surprisingly, this latest research also touches on sulfur, and how it is affected by glyphosate from food. “[W]e show how interference with CYP enzymes acts synergistically with disruption of the biosynthesis of aromatic amino acids by gut bacteria, as well as impairment in serum sulfate transport,” the authors write. For the past 30 years, Dr. Seneff has been passionate about teasing out potential causes of autism, after seeing what it was like for a close friend whose son was diagnosed. 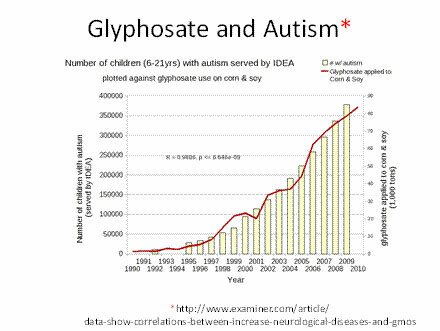 She points out the clear correlations between increased glyphosate use over recent years (the result of genetically engineered crops causing weed resistance, necessitating ever-larger amounts to be used) and skyrocketing autism rates. The rate of autism has risen so quickly, there can be no doubt that it has an environmental cause. Our genes simply cannot mutate fast enough to account for the rapid rise we’re now seeing. The latest statistics released by the CDC on March 20 show that 1 in 50 children in the US now fall within the autism spectrum2,3, with a 5:1 boy to girl ratio. Just last year the CDC reported a rate of 1 in 88, which represented a 23 percent increase since 2010, and 78 percent since 2007. Meanwhile, I remember when the incidence of autism in the US was only 1 in 10,000—just short of 30 years ago! Interestingly, certain microbes in your body actually break down glyphosate, which is a good thing. However, a byproduct of this action is ammonia, and children with autism tend to have significantly higher levels of ammonia in their blood than the general population. Ditto for those with Alzheimer’s disease. In your brain, ammonia causes encephalitis, i.e. brain inflammation. Another devastating agent you really do not want in your body is formaldehyde, which a recent nutritional analysis discovered is present in genetically engineered corn at a level that is 200 times the amount that animal studies have determined to be toxic to animals. Formaldehyde destroys DNA and can cause cancer. Other research backing up the Roundup-autism link is that from former US Navy staff scientist Dr. Nancy Swanson. She has a Ph.D. in physics, holds five US patents and has authored more than 30 scientific papers and two books on women in science. Ten years ago, she became seriously ill, and in her journey to regain her health she turned to organic foods. Not surprisingly (for those in the know) her symptoms dramatically improved. This prompted her to start investigating genetically engineered foods. She has meticulously collected statistics on glyphosate usage and various diseases and conditions, including autism. A more perfect match-up between the rise in glyphosate usage and incidence of autism is hard to imagine… To access her published articles and reports, please visit Sustainable Pulse4, a European website dedicated to exposing the hazards of genetically engineered foods. What the biotech industry, spearheaded by Monsanto, has managed to do is turn food into poison… quite literally, and in more ways than one. Here, we’re just talking about the effects of Roundup. There are plenty of indications that the genetic alteration of a crop itself can pose significant health concerns. So with the vast majority of GE crops, you have no less than two potentially hazardous factors to contend with, glyphosate toxicity being just one part of the equation. It’s important to understand that the glyphosate sprayed on conventional and genetically engineered crops actually becomes systemic throughout the plant, so it cannot be washed off. It’s inside the plant. For example, genetically engineered corn has been found to contain 13 ppm of glyphosate, compared to zero in non-GMO corn. At 13 ppm, GMO corn contains more than 18 times the “safe” level of glyphosate set by the EPA. Organ damage in animals has occurred at levels as low as 0.1 ppm. If that’s not reason enough to become a label reader to avoid anything with corn in it, such as corn oil or high fructose corn syrup, I don’t know what is. You’d also be wise to stop using Roundup around your home, where children and pets can come into contact with it simply by walking across the area. Until the US requires genetically engineered (GE) foods to be labeled, the only way you can avoid GE ingredients is to make whole, fresh organic foods the bulk of your diet, and to only buy 100% USDA certified organic processed foods. Meats need to be grass-fed or pastured to make sure the animals were not fed GE corn or soy feed. Last but not least, do not confuse the “natural” label with organic standards. The natural label is not based on any standards and is frequently misused by sellers of GE products. Growers and manufacturers of organic products bearing the USDA seal, on the other hand, have to meet the strictest standards of any of the currently available organic labels. In order to qualify as organic, a product must be grown and processed using organic farming methods that recycle resources and promote biodiversity. Crops must be grown without synthetic pesticides, bioengineered genes, petroleum-based fertilizers, or sewage sludge-based fertilizers. So the thousands of suicided farmers were conned illegally & the Indian Government stood by.